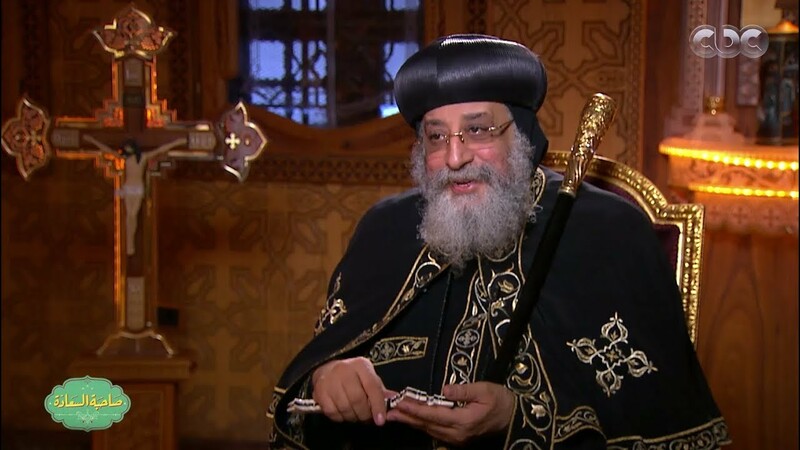 Egyptian viewers were treated to an engaging, warm-hearted, candid chat with Pope Tawadros II on the evening of 7 January 2018, the day which marks Coptic Orthodox Christmas, as guest of the talk show Sahibat al-Saada aired by CBC TV satellite channel. The show had been recorded prior to Christmas, and the talk show hostess was Essad Youniss, a TV presenter, film producer, writer, and widely-loved comedienne. Her talk show Sahibat al-Saada (literally ‘Giver of Happiness’, also a play on words on her name ‘Essad’ which has the same meaning) on CBC satellite channel is dominated by her charming, intimate, strong character, and her enlightened thought; as such it is among the most widely-viewed TV shows. Ms Youniss started off by thanking Pope Tawadros for generously hosting the show at the papal headquarters in St Mark’s Cathedral grounds in Abbassiya, Cairo. She introduced him as the true Egyptian who always says that Copts derive their power from the Lord first, and from their Muslim fellow citizens second. She said she wished to address his mind and heart; she was relaxed, courteous, and easygoing, and a gracious, comfortable, cheerful Pope responded by answering all her questions candidly, from the heart. The show was interspersed with photos of the Pope’s life since his childhood, with his family and friends, also with world leaders whom he met as Pope: the UK’s Queen Elizabeth, Russian President Vladimir Putin, German Chancellor Angela Merkel, and many others. There were also shots of him visiting the sick and injured in hospitals. Since the show was filmed right before the Feast of the Nativity, it was natural that Ms Youniss should first ask the Pope about Coptic feasts and the traditional long fasts that precede them. He explained in simple terms the various feasts and fasts, their peculiarities and the differences among them. To a question of what he personally broke his fast on after the lengthy period of fasting, he replied that it would be some warm soup and light food that would not ‘shock’ a stomach that had been used to light food during the long fast. The Pope talked of two significant jubiless which the Church will be celebrating this year 2018. The first is Holy Virgin’s manifestation in Zaitoun in 1968, seen over more than two years by people of all walks of life. The second is the opening of St Mark’s Cathedral in Abbassiya at the hands of Pope Kyrillos VI and President Gamal Abdel-Nasser. The Church will also mark the centenary of the establishment of Sunday School in the Coptic Orthodox Church at the hands of Habib Girgis (1876 – 1951), a singular layman who was canonised in 2013. To a question by Ms Youniss about what was ‘Sunday School’, he explained that it was an educational activity in churches that taught children principles and values which served to build their characters and teach them love of God and country. He said it was Sunday School which taught him to love Egypt so much; that Egypt was the place in which Jesus sought refuge while yet a baby when the Holy Family fled from the face of Herod the King (Matt 2); and that Egyptians received the singular blessing in the Bible “Blessed be Egypt my people” (Isaiah 19). He explained that Sunday School exploits the energy of older children to teach the young ones; he said he personally was given training to teach the young ones when he was yet 17, and began teaching at 18. Talk on patriotism brought on a question from Ms Youniss about the Pope’s relation with al-Azhar Grand Imam Sheikh Ahmad al-Tayyeb. Pope Tawadros said he enjoyed a good relation with Sheikh Tayyeb, and that this good relation overflowed to reach ordinary people on the street. Ms Youniss asked the Pope for a New Year message to Egypt and Egyptians; President Sisi; and Sir Magdy Yacoub, the Egyptian-born world-renowned cardiologist and surgeon who was knighted by Queen Elizabeth. Sir Magdy, the Pope said, carried Egypt in his heart despite the success he attained worldwide. Choosing Aswan to establish his cardiac centre, away from Cairo where most services are centralised, warranted respect and congratulations. The Pope warmly talked of what children meant to him, saying that children were very dear to his heart. “Every one of them is very special, a gift from God, a project for the future”, he said. He remarked that being with them was his most enjoyable pastime, the peak of his happiness. He had been responsible for the service of children as a bishop in the Holy Synod before he became Pope. He loved to tell them stories, he said. Now, he has a special TV programme in which he narrates stories to children live, clearly enjoying vivid interaction with them. Ms Youniss asked the Pope why he often used folk proverbs when he talked, to which he replied that folk proverbs were the pillar of people culture, and were very true. He said that the Bible included an entire book of Proverbs, and gave examples of how expressive they are. He talked of sports and said that even though he did not play football, he loved to watch the games and considered the Egyptian player Muhammad Salah an ‘artist’. On music, the Pope said he had always loved and found comfort in it ever since he was a child. He was of course immersed in Coptic Church music, but loved all other music. In his hometown, the West Delta town of Damanhour, the neighbours who lived on the same street celebrated jubilantly when their son was elected Pope in 2012. Ms Youniss talked to a few of these neighbours who talked very highly and fondly of him. The Pope said his family had been the only Coptic family in the building they lived in; the others were Muslims. They enjoyed excellent relations, he said. When he became a student in the Pharmacy school, he remembers that a female neighbour cautioned him: “Take care, my boy, I fear medicines more than I fear sickness”. As the Lord would have it, the monastery led to priesthood in 1990, and in 1997 the monk-priest was consecrated as General Bishop Anba Tawadros. He served under Bishop Anba Pachomius of Beheira [Beheira is the province of which Damanhour is the capital city]. In March 2012, Pope Shenouda III passed away, and Anba Pachomius became Acting Patriarch, a task he performed with integrity and honour which earned him the love and respect of all Egyptians. His disciple Anba Tawadros was selected Pope in the wake of elections and an altar draw, an event which delighted him and the entire congregation. In November 2012, Pope Tawadros was enthroned in a moving ceremony which brought visible, heartfelt tears to his eyes—and to all who watched the event. Why did he weep then, Ms Youniss asked. The Pope’s reply was that he felt he was undeserving of such a great honour that would moreover give him a rank superior to his mentor and guide Anba Pachomius. In addition, and equally weighty, he said, was the full realisation of the heavy burden and responsibility he would have to shoulder. Beyond doubt, Pope Tawadros has shouldered with responsibility with love, wisdom, and grace.